Pros The Spalding "Beast" has a 60-inch backboard made of 1/4 inch thick tempered glass with a steel and aluminum surround. The base holds 50 gallons of sand or water for extra stability and it will hold up to aggressive play. Cons Users report the goal may be difficult to assemble, and have also had issues with water leaking from the base, when water is used as the ballast. Summary The Spalding Beast is an expensive goal, but if portability is a must, this heavy, sturdy goal can be moved indoors if necessary, or to another point on the driveway or patio. The price makes it an investment in sports equipment. Pros A portable system featuring a 60-inch, tempered glass backboard. The goal can handle aggressive play and is adjustable from 7 to 10 feet in height. It also has a breakaway rim for safety. Cons Some users say the pole flexes too much after extended play. Assembly may be difficult and require a professional. Summary A sturdy, stable system that provides realistic play, and is equally good for pickup games, or for basketball players to hone their skills. 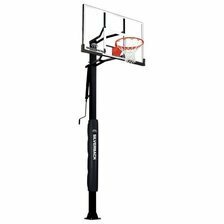 Pros Featuring a breakaway goal, the Silverback 60-inch basketball goal is an in-ground goal, is sturdy and will withstand aggressive play. The backboard is tempered glass, and the height is adjustable from 7 to 10 feet. Cons The in-ground installation may be a drawback, since it becomes a permanent fixture. It also requires either professional installation or someone experienced in DIY projects. 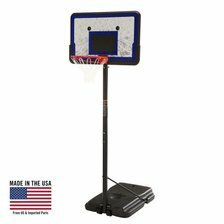 Pros The Lifetime basketball goal has a 52-inch, shatterproof backboard, and adjusts from 7.5 to 10 feet. The base holds 35 gallons of water or sand for stability. The unit is sturdy enough for moderate use and can be stored outdoors. Cons Users say assembly can be very difficult, and does require a power drill for drilling one of the holes. Instructions may be confusing. 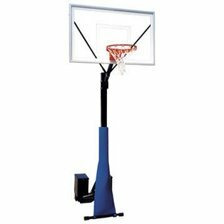 Pros The Lifetime 1221 Pro Court basketball goal is adjustable in height, from 7.5 feet to 10 feet, 6 inches. The backboard is durable, and the base can be filled with sand or water for ballast. Cons The backboard is not offset from the support post, meaning players could run into the post. Users have also reported item being shipped with pieces missing, as well as some difficulty in assembly. Summary This goal works for backyard or driveway pickup games. 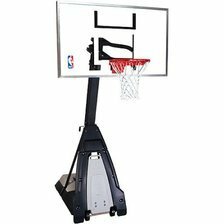 For the price, it's good for players wanting to practice basic skills, like layups and free throws.